The importance of Greco Roman strength and conditioning can never be understated. Athletes have to account for every single muscle group at every moment of a match. A wrestler’s legs, core, back, and shoulders are constantly being taxed. Then when it is time to strike, the ability to do so with uncompromising explosive force is of extreme importance. The slightest delay or hesitation may not only lead to a throw or technique coming up short, but it can also result in being countered and thrown by an opponent. Being physically prepared for every situation means training the right way and focusing on exercises that encourage efficient action. 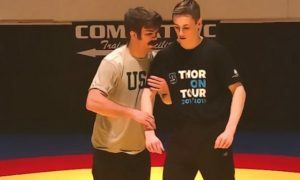 In this video, Brandon Siakel, the Strength and Conditioning Coach for the US National Team at the Olympic Training Center, puts members of the Greco Roman team through a series of exercises designed to maximize power and efficiency. 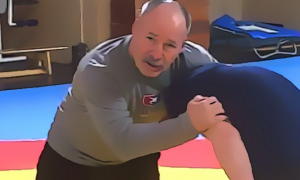 As you will be able to see in the clip, Siakel goes over several movements that keep in mind the “Greco stance”, which allows the wrestlers to train with an element of sport-specificity. For each position, Siakel provides in-depth explanations as to what he is looking for out of the athletes and how/why an exercise is beneficial. Also, pay attention to the dialogue in between exercises, as Siakel points out further details which are of interest in regards to the previous movement. Just as it is for throws during matches, technique is critical for Greco Roman strength and conditioning. Starting off with too much weight for the barbell exercises defeats the purpose of gaining explosive power. Siakel tells the athletes only to increase weight once that level has been attained. In the video, volume is the first objective. Give these exercises a try at your own pace. If possible, get the help of a partner and coach so that someone is there to correct you and also, keep you safe. But there is no doubt this training regimen works. Just check out a few of these wrestlers’ bouts from over the past year or two and you’ll have all the evidence you need.